When determining whether a real estate market is either a Buyer’s market or a Seller’s market, you have to look at several factors: time of year, price point, location and job availability. Typically, when inventory is high, we have a buyer’s market and when inventory is low, we experience a seller’s market. Today, as reported by Inman.com real estate news, economic analysts have reported that it won’t be a buyers until 2020. However, that is a generalization across the country and real estate is local in nature. Micro markets like Weston, perform differently. Presently in Weston, the under $500K price range is clearly a seller’s market. We are seeing the shift in other price points as well where inventory is increasing and sellers need to be cognizant of days on market and condition of their homes vs the active competition. Weston has always had a unique market. The Weston market is currently two fold. The big denomination is price range and zip code. Today in Weston, there is high inventory of luxury homes priced over $1 million. The luxury market is currently experiencing longer days on market because, although the luxury buyer pool remains steady, property values, have consistently increased since 2011. This in turn, has pushed a higher number of properties over the 1 million dollar luxury threshold to come to the market. As well, the Weston population is shifting and creating a cycle where empty nesters are looking for smaller or more urban settings to call home. Their children are now coming to Weston to raise their families. 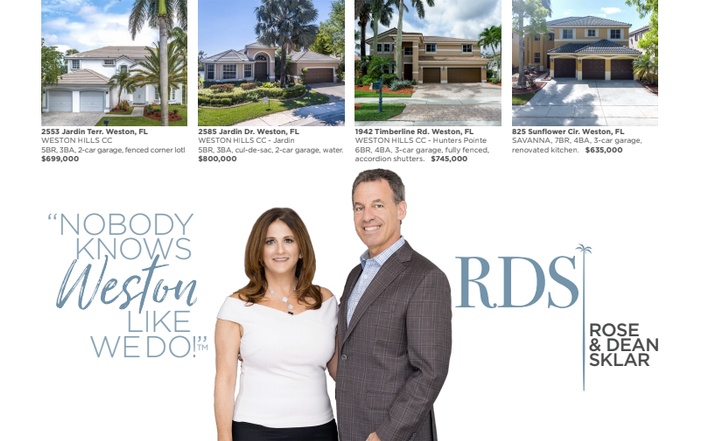 As of July 2018, according to the multiple listing service, we currently have 33 months of inventory over $1 million in Weston, with approximately 2 buyers per month. On the flip side, The millennial buyers, who are now aging into first time home buying status, have been slower to buy, generally having children later than previous generation with much more emphasis spent on lifestyle, yard for dog and walkability. Both generations are vying for the same inventory of homes, making the under $500K a seller's market with only 2.8 months of inventory (per MLS July 2018) which can create a bidding war. Just recently, one of our buyers purchased a home in Weston where there were 4 offers fighting for the under $400K home. Feelings came sweeping through of the days of 2007 when buyer's were removing appraisal contingencies and inspections. Even though the house was in need of upgrading, the buyer pool is very strong in the under $500 price point. There is now more demand for affordable start up homes with the growing Millennials population and surge of empty nester buyers who are now downsizing. This market is more in line with a seller's market, where multiple offers are again being received especially homes with recent upgrades or strategically priced. These homes are being gobbled up. Trends toward smaller more moderate homes, with the hype of the little homes on HGTV as well as other fixer upper programs, more amenities, changing values, walkability, having smaller families Lastly, for the Weston homeowner, it is important that they keep up their current home with maintenance and timely updates, like Smart Home Accessories and efficient A/C and appliances, as well as roof upkeep, updating kitchen, bathroom and floors, which are high return items when selling a home and greatly enjoyed by all. This holds true for all price points in Weston. Keep an eye out for our next article on Home improvements that matter in all markets.